Yes, Uncle David ("Big Fish") is proud of Bud (Minnow)! His U. S. College hockey debut was a good one! The Bobcats lost but Bud played a stellar game between the pipes! Keep up the great work, Budmeister! After a 30-save effort in his collegiate debut against Michigan, Quinnipiac University goaltender Bud Fisher was named to the ECAC Hockey League weekly honor roll on Monday evening. 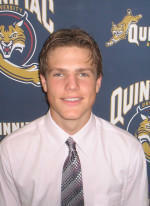 The Peterborough, Ontario native enjoyed an impressive outing in the 2005-06 season opener. Sixteen of his 30 saves came in the second period against the Wolverines. Quinnipiac returns to action on Friday night at 7 p.m. for the 10th annual Quinnipiac Cup. The Bobcats will host the Rochester Institute of Technology in the second semifinals contest. Air Force and Bentley will play in the first semifinal at 4 p.m. The consolation game is Saturday at 4 p.m. The title game is on Saturday night at 7 p.m. Quinnipiac has won seven of the first nine Quinnipiac Cups and five in a row. does hockey run in the Fisher veins? must, eh!